OPI's latest collection (I think...it's so hard to keep up sometimes) was inspired by the release of Burlesque starring Cher and Christina Aguilera. I have no opinion in regards to the movie, as it's not my thang, so I won't be seeing it. The polishes, on the other hand, I have not only opinions on, but pictures, too! 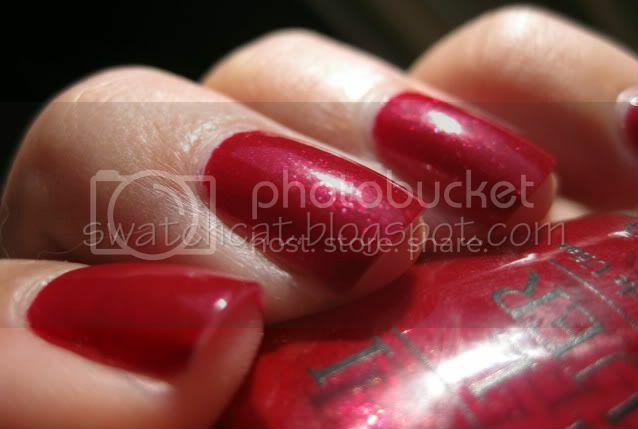 First up, Ali's Big Break, which is a beautiful blood red with fuschia and gold flakies. The flakies really give ABB a lit-from-within glow. Unique, not so much, although, I didn't have a color quite like it. This is three coats, and pardon the tip-wear. I'd been wearing it a couple of days before the sun finally came out so I could photograph it. Rising Star is a metallic copper. I really think Rising Star should've been part of the fall collection. The shiny, warm copper just screams, "Fall!!" It reminds me of glowing Sugar Maple leaves at sunset. Very pretty and shiny, and not quite blinding in the sunlight...which is good for me, because I tend to stare at my nails while sitting in traffic. This is three coats, but it was opaque at two. Show It & Glow It! is a pretty silver and fuchsia based glitter with yellow, orange, green and blue glitters throughout. As far as glitters go, this one is pretty great. Three coats for full coverage, and it dried nearly smooth. You'd just need a thin topcoat to even it out. Also, removal was a breeze. No scrubbing or chipping to get the glitter off! I only got this one glitter, but I'd guess the other three are just like this one. 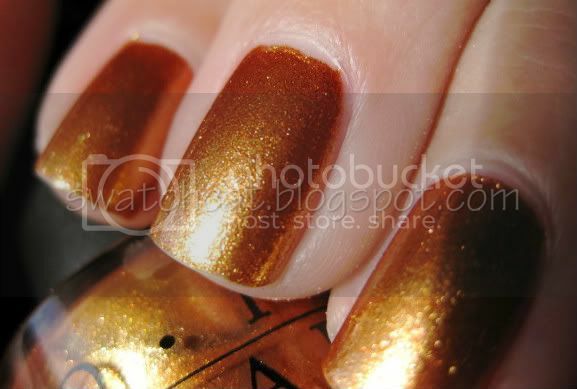 Tease-y Does It is a smokey base chockful of fuchsia and copper sparkles giving it a fiery glow. Reminds me a bit of how MAC Beauty Marked looks in the pan. 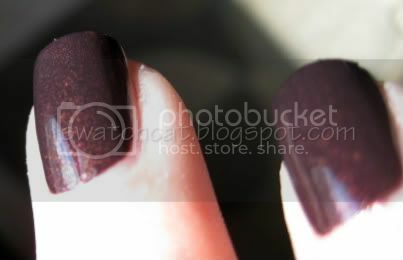 In my vast collection of dark, vampy colors, I don't have a single one like Tease-y Does It. I love the glowy sparkles in the dark base and if you tilt your hand just right, you can see the smokey grey come through. 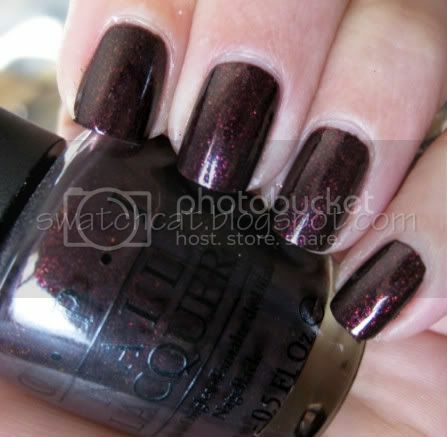 There are several other colors in the OPI Burlesque Collection, I just got the four. The collection is available at most beauty stores and retails for $8.50 per bottle. Agreed! This is glitter done right. Not only do they apply smooth, but removal is a breeze!